A joy to listen to. Clear and clean solos and bravura cadenzas... a delightful performance, with an experienced soloist. - Bridport Newspaper review, Mozart Concerto in D.
ANNE ALLEN quickly became recognised as an exciting young flutist, graduating from Cambridge University and the Royal Northern College of Music with Distinction. In great demand internationally, she has played in all the major UK venues and abroad in Europe, the Far East, Africa, Russia and South America. Anne has performed solo concerti with orchestras including the BBC Concert Orchestra and in June 2007 performed Frank Martin’s Ballade in the Cadogan Hall, London, accompanied by the Southbank Sinfonia. Anne is Principal flute with Vox Vanguard, a Multi-Media production company that breaks down barriers between the performers and audience in creative, dramatic ways, The London Classical Soloists, conducted by the internationally acclaimed conductor Achim Holub, and The Philharmonic Chamber Orchestra of London, conducted by the exciting new conductor Christopher Petrie. Anne has also performed on Radio 2, Radio 3, Classic FM, BBC TV and Sky TV and has performed on various film soundtracks. 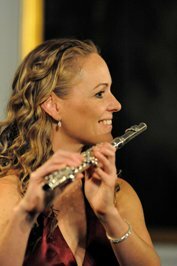 An accomplished orchestral player Anne plays the flute, piccolo and alto flute in many professional orchestras and opera companies including the BBC Philharmonic Orchestra, Bournemouth Symphony Orchestra, Northern Chamber Orchestra and English National Ballet. Winning the Audience Favour Prize in Moscow and appearing as Principal Flute in the Orchestra of the World conducted by Valery Gergiev have been highlights in her orchestral career so far. Anne enjoys the lighter side of music making, playing for shows and in a jazz duo, and takes great pleasure in providing entertainment for a variety of occasions and events across the UK. Her range of bookings spans parties, weddings, business events - even openings of buildings! Her clients range from members of the Royal Family to companies such as PWC. Highlights in this side of her career include performing to David and Victoria Beckham and the British Olympic Committee in Singapore. Having spent a great deal of time in hospital recovering from a bone tumour, a highly valued side to Anne’s career is performing for the charity Music In Hospitals which brings entertainment to the ill and elderly within the community. Anne brought joy and calmness to the ward. An amazing performance. Anne performs with various chamber groups that play a wide range of repertoire in many locations. 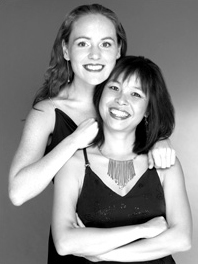 including Duo Tones, The London Flute Duo and The Ancora Duo, a flute and guitar duo. She take great pleasure in tailoring each booking to the requirements of each client. Any special requests are happily accommodated. Their highly polished professional technique means that they every ensemble can perform unamplified which can greatly simplify the organisation of the day. Anne plays on a Louis Lot flute, built in Paris in 1872 by Louis Lot himself. It was bought with the generous help of Felicity Belfield and Margaret Ingle-Finch. Anne Allen is an extremely talented young flautist. Her performance was exemplary...she has a beautiful natural tone, but also a strong sense of colour and characterization. - Roger Vignoles, International Pianist.